The Nokia 5300 is billed as a music phone, the latest attempt by the mobile giant to take a share (however small) of the MP3 player market. 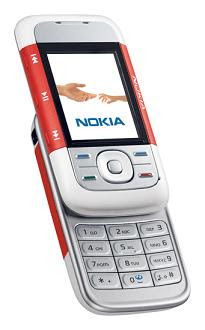 The 92.4 x 48.2 x 20.7 mm mobile is certainly a departure from the highly stylised black sleek fashion phones with its funky white with red stripes and strange rubberised buttons and grips. First impressions count and when the Nokia 5300 arrived at the offices for review it drew a mixed reaction with those who liked the N80 and N72 suggesting this was a child's toy, yes because this phone is plasticky look but it is remainder feeling it was a bold design and a fresh approach. The 5300 is another slider phone with what feels like a rugged build quality and this model has a certain chunkiness about it which is in part helped by the rubberised buttons which feel industrial to the touch. 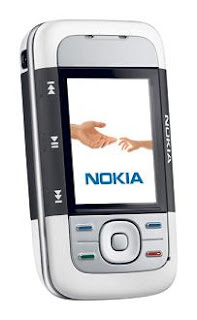 The screen is a decent size with a QVGA 320 x 240-pixel resolution and a very clear and bright display, the GUI is standard S40 stuff but for a non smartphone this is about the best Nokia have to offer. As a basic everyday phone the tri band system seems good enough and our tests proved that it held calls like a mobile Jack Russell. The full range of data service are available with HSCSD/CSD and GPRS and these combined with basic PIM functions of the Series 40 operating system mean you can pick up email and browse the web. although the 5300 isn't exactly a phone for business. You'd look pretty weird with the humbug inspired design phone clamped to your ear in the boardroom. Instead the device is clearly targeted at the teenage market where multimedia and games combined with messaging are king. Multimedia and the express music phone is this models big selling point and support for MP3, Midi, AAC, AAC+, ACC+, and WMA formats make for a powerful media device that can play non DRM iTunes tracks along with MP3 and files from Windows Media player. This sadly is where Nokia get it a little wrong when compared to the Walkman branded mobiles from Sony Ericsson. the 5300 does not come with an internal hard drive and the internal storage that is free for users is a measly 5mb, barely enough to store 1 track encoded at 192kbps. Instead Nokia rely entirely on the microSD card slot and the provided 256mb card for all the multimedia storage, this seems a bit daft given all the heavy promotion. You can specify a 2gb card although this will set you back between £35 and £40. Should you exhaust your MP3 collection there is always the standard Nokia FM radio. Operation of the media player is simple through use of the dedicated buttons alongside the screen, these allow you to skip / play and pause easily as well as adjust the volume level. Used in conjunction with the excellent media player GUI it is almost as easy to use as the Sony Ericsson W850i but neither come close to being an iPod. You also get a 1.3 mega pixel camera mounted in the rear of the phone which can take both pictures and short videos, the latter of which can be used as ringtones. A strange and highly annoying decision for a music phone is Nokia's instance of providing a headset that requires its own plug system and not providing a standard 3.5m jack socket. So we were forced to perform all of our tests using the HS-47 headset supplied with the 5300 or to use the adaptor block to use standard earphones. Once again a compromise between either mediocre sounds or extra bulk and another "extra" that is easily lost. In part this explains the average results from our review of the media player, the software is good as we have seen in previous models with an intuitive GUI and quick access in a logical layout to the stored tracks. The let down is the sound quality which sounds decidedly flat even when testing using Fatboy Slim tracks which are not normally "flat". On the Nokia earphones it sounds pretty bad and nothing like a good MP3 player, using our Shure E2C's and the adaptor things get a bit better but mp3 standard software provided by Nokia, 5300 fails to drive them properly not like Walkman phone by Sony Erricson headphone. The last element we checked was the battery life, standby is quite good if you remain in a reasonable coverage area with more than 2 bars shown, we got close on 4 days with minimal calls and the music player will run for around 14 hours before killing the battery. Overall the Nokia 5300 music phone is a mixed bag, as a phone it is a bit chunky and the styling will not be to all tastes. As a music player it works well but is let down by limited storage provided on microSD and the failure (yet again) to house a native 3.5mm stereo jack on the phone, instead relying on extra adaptors. A shame really as the crown of the "ultimate walkman phone" is still up for grabs.